AgrAbility and USDA Youth Safety Grant Family Program Highlighted at WV State Fair. 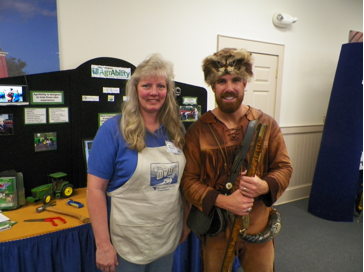 WV AgrAbility staff members Inetta Fluharty and Amanda Fulk provided information on improper use of farm machinery and firearms--two of the leading causes of farm fatalities in West Virginia--at a booth during the West Virginia State Fair in Lewisburg, WV August 12–17. They promoted AgrAbility and USDA Youth Farm Safety (YFS) with emphasis on ergonomics and assistive technologies for farmers with disabilities.. Highlights also included awareness training, such as ATV safety for youth and adults. This training is part of the YFS program, which is designed to reduce West Virginia youth related farm deaths and injuries. West Virginia counties prominent in the YFS program this year include Hampshire, Hardy, Doddridge, and Putnam. Underserved WV farms have inherent hazards related to the use of machinery in mountainous and rough terrain, environmental and chemical exposures coupled with a lack of agricultural safety education for many part-time farmers, and, additionally, there exists a lack of proximity to medical facilities when injuries occur. 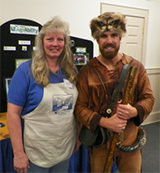 WV AgrAbility staff attended the People First of West Virginia Conference September 4-6. Accessible Gardening and Computer Access are topics for individuals with intellectual or developmental disorders to help instruct, train, and assist to achieve the highest level of independence and self-sufficiency possible in their lives.